Over the past four days, Event #37: $2,500 Eight-Game Mix has played out at the 2012 World Series of Poker and tested 477 players’ mettle in a variety of games: Triple-Draw 2-7, Limit Hold'em, Omaha 8, Razz, Stud, Stud 8, No-Limit Hold’em, and Pot Limit Omaha. While many played well, there could only be one winner, and that man was David Baker, who was long overdue to win his first gold bracelet. Yesterday, the tournament began with Joe Couden leading the final 27 players with 303,300. With that said, he was facing some stiff competition including the 2009 champion of the event, Jerrod Ankenman, and twelve other bracelet winners that included Rep Porter, Jennifer Harman, Scott Seiver, Konstantin Puchkov, Freddy Deeb, Greg Mueller, Chris Viox, Donnacha O’Dea, Jeff Madsen and Barry Greenstein, though only four would make their way to the final table. Nine players combined to the last table, though the official final table wouldn’t be determined until it was down to eight. That happened when O'Dea raised to 16,000 from middle position in a hand of pot limit Omaha and received three calls. The flop saw three checks to Baker on the button. He put out a bet of 50,000, which was enough to get Couden to fold from the small blind. Mikal Blomlie then announced, "Pot," from the big, making it 214,000 total. "Nice slow roll," Blomlie said, clearly frustrated. The rest of the table didn't seem to think that was the case, pointing out that a set of tens was the bottom of Baker's range in that spot. It didn't seem to console Blomlie as he watched the turn and river seal his fate in ninth place, just one spot shy of the official final table. Couden, who began the day as chip leader, had the biggest stack at the start of the final table, though only with a slight lead over Baker. The first elimination of the final table came in Stud Hi/Lo when O'Dea completed with the and then called a raise from Viox, who was showing the . Viox proceeded to bet every street until he was all in for 38,000 on sixth. O'Dea's pair of deuces was in the lead for the high, while Viox was looking to either pair of draw a low for part of the pot. O'Dea improved to two pair with the on seventh, meaning Viox needed a low card that didn't pair him to secure half the pot. He squeezed it out and you could tell by the look on his face it wasn't low. It was the to put an end to his day in eighth place. It was also around that time that Mueller hit a heater and took over the chip lead, which you can read about by clicking here. The next to go was Christopher McHugh, who met his end in a big hand of Stud Hi/Lo right before the dinner break and earned $31,578 for his seventh-place finish. Upon returning from dinner, the game was 2-7 Triple Draw and action folded to O'Dea on the button, which inspired him to raise to 50,000. Puchkov called from the small blind and then both men drew two after Kevin Calenzo folded from the big blind. It took awhile for the next elimination to occur but it happened after O'Dea lost a big pot in 2-7 Triple Draw to Mueller and he was left short stacked. Not long after, O'Dea raised it up on third street to 40,000 after which Calenzo made it 80,000. The other players folded after which O'Dea called. On the turn, Calenzo bet 40,000 once more and O'Dea called. Fifth street gave O'Dea the betting lead, but he opted to check again. Calenzo fired out 80,000 and O'Dea called with just 40,000 chips left behind. On sixth, O'Dea's check-called his final 40,000 and we got to showdown. Calenzo showed for a pair of sevens and O'Dea was trailing with just . O'Dea was looking to catch an ace, king, queen or nine to take the lead, but his draw was dead when Calenzo turned over the . O'Dea improved with the , but couldn't beat Calenzo's trips. In limit hold’em, Couden raised to 80,000 from the small blind and Mueller defended his big. The flop came down and Couden bet 40,000. Mueller raised it up to 80,000 and Couden hesitated for about five seconds before putting in 120,000. Mueller put his opponent all in for 10,000 more, which brought us to a showdown. Mueller turned over and was ahead against Couden's . The turn was the and the river the giving Mueller the chips and the knockout. 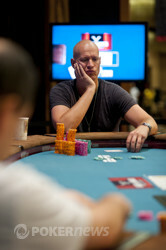 Couden, who began both the day and the final table as chip leader, was eliminated in fourth place. 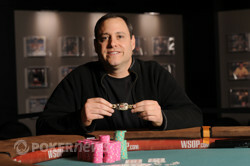 A little later on in the Omaha Hi/Lo round, Calenzo was on the button and raised to 100,000. Mueller defended the big blind and then led out on the flop, Calenzo, who had been crippled in a hand of Stud a short time prior, raised his last little bit and Mueller made the call. 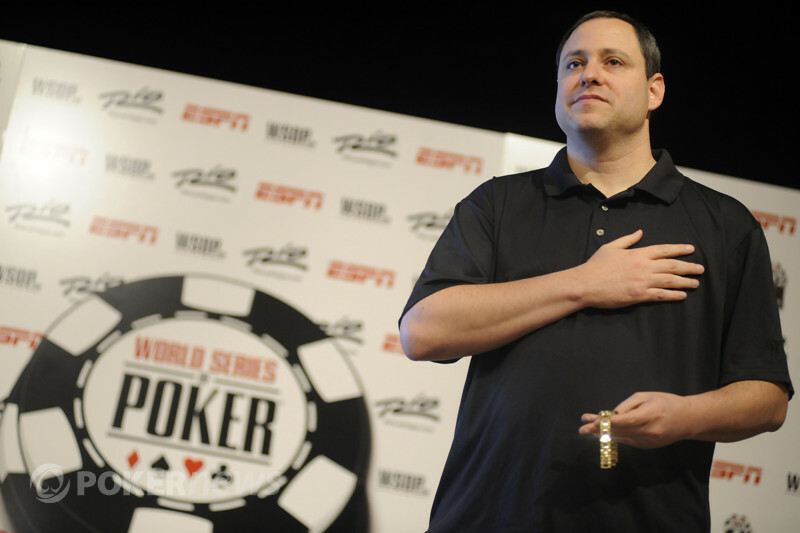 Calenzo was in bad shape when the money went in, but the turn did give him a flush draw. Unfortunately it wouldn't be filled as the bricked on the river and sent Calenzo home in third place. Head-up began with Mueller holding a 4-1 chip lead over Baker, but a victory was by no means guaranteed. The two battled until the hard-stop time, which meant they’d return on Friday for a Day 4. A little sleep seemed to do wonders for Baker as he battled back from the brink of elimination and took over the chip lead. Mueller made a small comeback of his own, but Baker pushed back and eventually vanquished his foe. Congrats to David Baker on winning Event 37: $2,500 Eight-Game Mix, the $271,312, and perhaps more importantly, his first WSOP gold bracelet. That does it for our coverage from Event #37 $2,500 Eight-Game Mix. There are still 25 events on the WSOP schedule, so be sure to check out our Live Reporting Section to find out which tournaments you can follow throughout the summer. Both players were dealt an ace to start, but David Baker's was the bring in. Greg Mueller completed with the , Baker called, and it was off to the turn. Baker had the lead and bet, Mueller called, and Baker proceeded to lead out on fifth. Baker held the lead when the chips went in, and he clinched the victory on sixth. "Good game, David," a resigned Mueller said as he shook hands with his opponent and made his exit in second place, good for $167,637. Greg Mueller was just knocked down to three big bets in a big hand of Razz. David Baker has a big chip lead, and Mueller will have to win an all in soon to get back into this thing. Mueller had the bring in, and Baker raised it up to 100,000. Mueller three-bet to 200,000 and Baker called. On fourth street Mueller bet 100,000 and Baker made the call. Fifth street gave Baker the betting lead, and he fired out 200,000. Mueller made the call, and on sixth street the lead was back on Mueller. Het bet 200,000 and Baker raised it up to 400,000. Mueller called. Seventh street was dealt face down and both players checked. Baker turned over , and Mueller said that was good enough to take the pot. Mueller showed and flipped the up afterwards. "It was a no spotter, deuce or trey one time!" Mueller said in disgust as he just got crippled. Greg Mueller raised on the button and received a call from David Baker. The latter proceeded to check-call a bet on the flop, before check-folding to a bet on the turn. Two hands later, the exact same action took place on the flop and turn, allowing Mueller to take down two decent pots without a showdown. Greg Mueller just lost a serious pot in Stud bringing himself down to just a few big bets. The bracelet is within reach now for David Baker. Mueller brought it in for 30,000 and Baker raised it up to 100,000. Mueller called and Baker bet 100,000 again on fourth street. Mueller raised it up to 200,000 and Baker called. On fifth street both players checked. Sixth street gave Mueller the betting lead with the and he checked. Baker bet 200,000 and took the pot down. Mueller is now in serious danger as we head into the Omaha Eight or Better portion of the game.